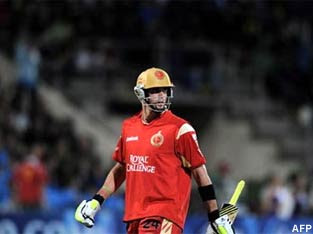 Royal Challengers 184 for 4 in 19.1 overs, beat Kings XI Punjab 181 for 5 by 6 wickets. For a change, almost all batsmen in Kings XI contributed to the total of 181 for 5. Bisla 28 of 26, Sangakara 45 of 27, Bopara 42 not out of 33, Yuvraj 36 of 20 and Irfan a whirlwind 16 of 5. were the main scorers. For Royal Challengers, Vinay Kumar,Steyn, Kallis and Kumble picked up a wicket apiece. Kallis was expensive at 4.0.45.1. 181 appeared a pretty decent total to defend. Royal Challengers lost Kallis early caught by Bisla of Srivatsava for 9 of 10. Pandey made a decent 29 of 25, before he was unfortunately run out on his follow through. Kohli made a brilliant 42 of 26. Royal Challengers were looking down the barrel with 122 for 5 at 15 overs , with 60 to get in five overs. Twelve runs were added in the 16th over but Challengers lost Kohli. Uthappa joined Pietersen, and played as only he can. He blasted LEE to every part of the ground and made a sweet 22 of 8 deliveries. Lee went for 25 runs in his 3rd and team's 17th over. Challengers marched through with 184 for four with five balls to spare. Kings XI performance was Pathetic, disastrous, spineless, add any number of adjectives. They fielded poorly, let go too many catches, the field placements and bowling changes were poor,and deserved to lose. Woefully, Chawla, who has been very liberal in giving runs to bring in excitement, and Yuvraj Singh, who has been entertaining the spectators with his dancing display against short pitched deliveries are in the WC T20, where as Kohli, Manish Pandey and Uthappa ( let us not forget Amit Mishra) are not in. What an Irony. The Selectors definitely have to have some answers.